We love all things French: French wine, French chocolate, French fries…but we digress. French doors make it into our top-ten list of favorite French things for good reason. These entryways originated in France several hundred years ago as large windows with a frame that opened, and had a purely practical purpose – they let in light to areas that needed it before electricity was invented. Luckily, in this case, necessity was the mother of style. Far from becoming obsolete after the invention of the light bulb, these beautiful entryways have flourished and become a coveted addition to the modern home. What’s the best way to capitalize on the beauty of French doors? We may be a little biased, but we think the answer is curtains, and there are many window treatments that work well with a set of French doors. A set of gauzy sheers on a simple curtain track can be a beautiful compliment to the entryway. 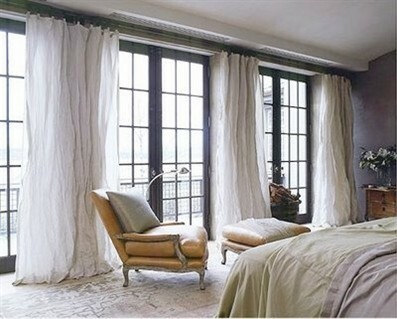 If you need more privacy, a set of heavier fabric curtains over a sheer is a great way to “close off” the room when needed. If you want something even heavier, our Eclipse Light-Blocking Curtains are a great option for privacy and room darkening, with the added bonus of sound-blocking, too. These are particularly useful if you are one of those lucky souls who have a set of French doors in your bedroom. Any of our popular ceiling curtain tracks will work well for this application. Some of our tracks can even be recessed into the ceiling, creating a seamless floor to ceiling look that adds visual height to the door and allows you to treat the whole area as one design element. The 6100 Flexible Curtain Track is also a good choice. It is a sleek, simple track that can be mounted on the wall or ceiling and bent by hand into curved or angled shapes. Our high-quality drapery hardware, including curtain carriers and gliders, allow the curtains to be opened and closed smoothly and quietly. C’est bon! For more design ideas and inspiration for your French doors, be sure to visit us on Pinterest!